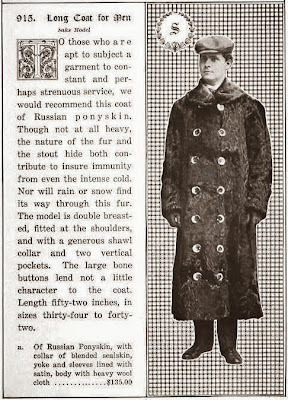 For those who could afford it, fur was the best material in the constant battle between warmth and weight. It was the material of choice for high end cold weather motoring garments, as it was water and wind resistant and above all, warm. 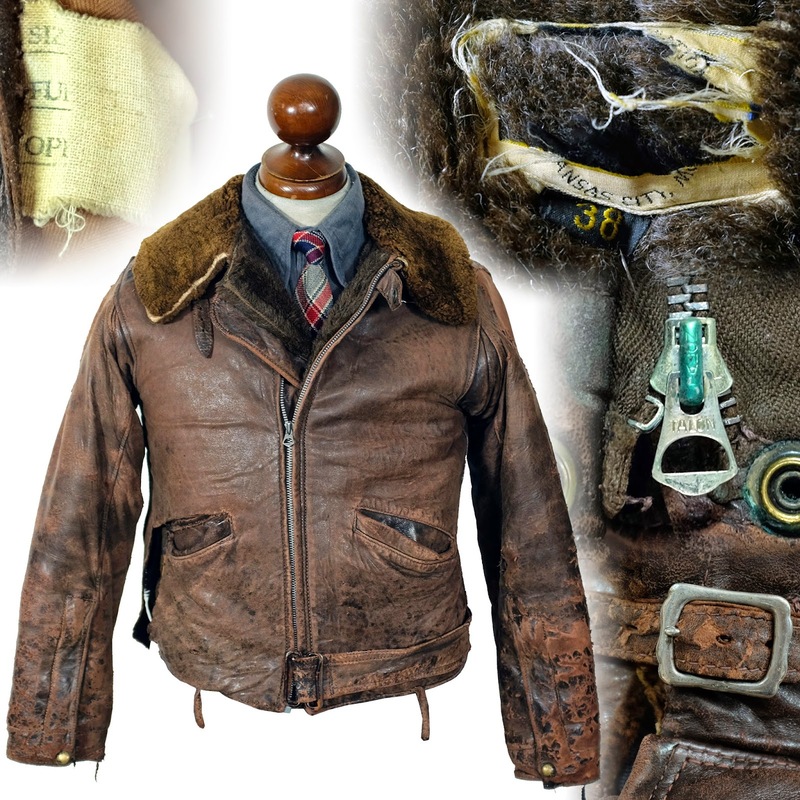 At this point, leather was used mostly for windproofing, and was often found on the inside of coats as a lining. Below is an ad from 1905 for a Russian ponyskin coat. While fur coats were warm and attractive, they were also expensive. The sheeplined coat evolved from these fur coats around the turn of the century, replacing the fur of the lining with sheepskin, but otherwise keeping the design. They generally were double breasted, with large shawl collars. The cut was also favored by coats made of Mackinaw wool. After WWII, these sheeplined coats would start to be (incorrectly) called mackinaws as well. As would happen later with the "grizzly", sheepskin (and alpaca pile) was a less expensive alternative to fur. This was especially true of Mouton, which is sheepskin electrically or chemically treated, dyed and sheared to resemble fur. Mouton went under many different trade names which played up the fur association. BeaverTex, American Wombat, Laskin Lamb, etc. Despite being made of mouton fur and leather, the early name for what is now known as the "Grizzly" was the "Fur Blouse". While most Grizzly Jackets were made of horsehide and mouton, early "Fur Blouses" truly were fur. 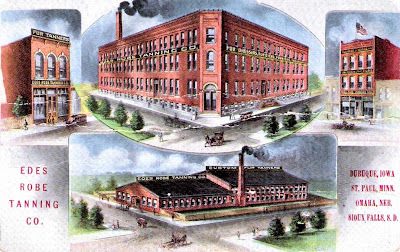 The Edes Robe Tanning Company was founded c.1905 by Canadian-born St. Clair Ede. The company once had locations in Dubuque, Iowa, Saint Paul, Minnesota, Omaha, Nebraska and Souix Falls, South Dakota. Their primary business was ponyskin lap robes for carriages and early open automobiles. As carriages were replaced by automobiles, and as car design became enclosed, the need for fur robes mostly evaporated. 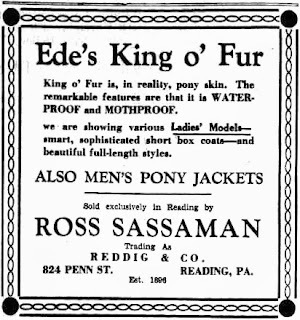 Faced with a changing market, Edes focused their attention on their fur coat business, producing fur coats for men and women under the King-O-FUR label. 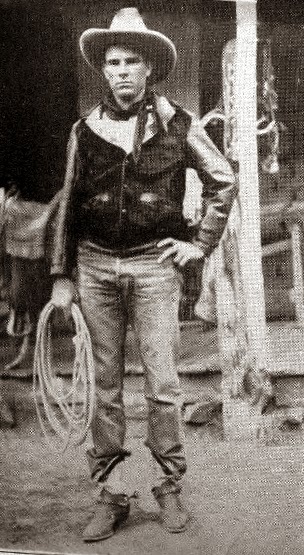 Unlike many furriers, Edes took styling cues from the new waist-length outdoorsman's leather jacket styles, but made them in the material they knew best- ponyskin. Men's Pony Jackets by Ede's King-O-FUR. Waterproof and Mothproof. Early jacket in the knit knecked style innovated by Summit in the 1910s. Below: A 1927 King-O-FUR model. Ponyskin body with horsehide sleeves and trim. Made in a then-new cossack style with a snap front. 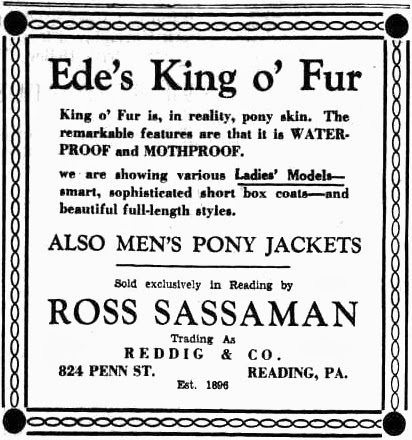 King-O-FUR advertised their jackets as being practical in both extreme cold and in the heat. The jacket, with leather sleeves and trim and a fur body would catch on. Other companies began producing the style, modified with thick mouton panels instead of hair-on ponyskin, in the early 1930s, with the style peaking in popularity in 1937. King-O-Fur would introduce the slogan "Not an Imitation and Not Imitated". St. Claire Ede died in 1938 and the company was taken over by his widow Louise A Ede. The company was dissolved on November 15, 1939.